Unisis was established in 1978 as a trading company that specializes in medical supplies. Soon after our foundation, we developed our trustworthy relationship with our customers in the U.S. and Europe. 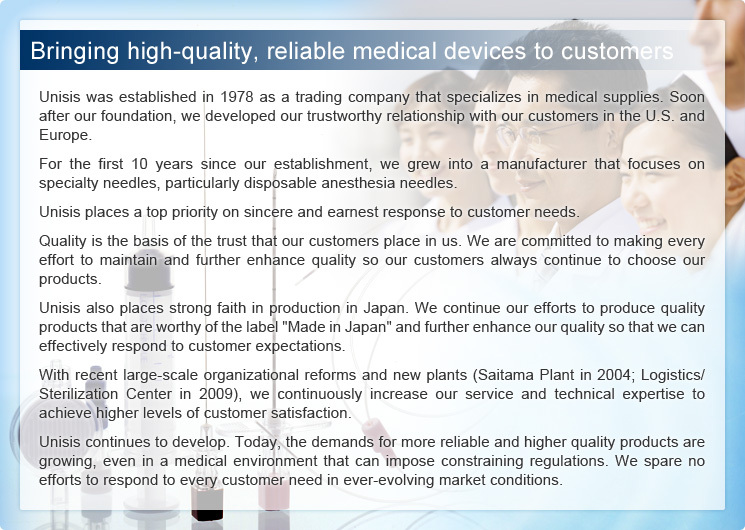 For the first 10 years since our establishment, we grew into a manufacturer that focuses on specialty needles, particularly disposable anesthesia needles. Unisis places a top priority on sincere and earnest response to customer needs. Quality is the basis of the trust that our customers place in us. We are committed to making every effort to maintain and further enhance quality so our customers always continue to choose our products. Unisis also places strong faith in production in Japan. We continue our efforts to produce quality products that are worthy of the label "Made in Japan" and further enhance our quality so that we can effectively respond to customer expectations. With recent large-scale organizational reforms and new plants (Saitama Plant in 2004; Logistics/ Sterilization Center in 2009), we continuously increase our service and technical expertise to achieve higher levels of customer satisfaction. Unisis continues to develop. Today, the demands for more reliable and higher quality products are growing, even in a medical environment that can impose constraining regulations. We spare no efforts to respond to every customer need in ever-evolving market conditions.